Mexico is known for colorful festivals. 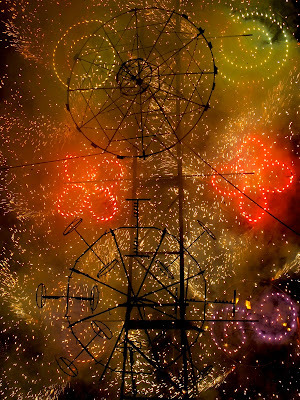 Oaxaca has one of the most unique in La Noche de Rábanos, celebrated December 23rd in the zócalo for more than a century. 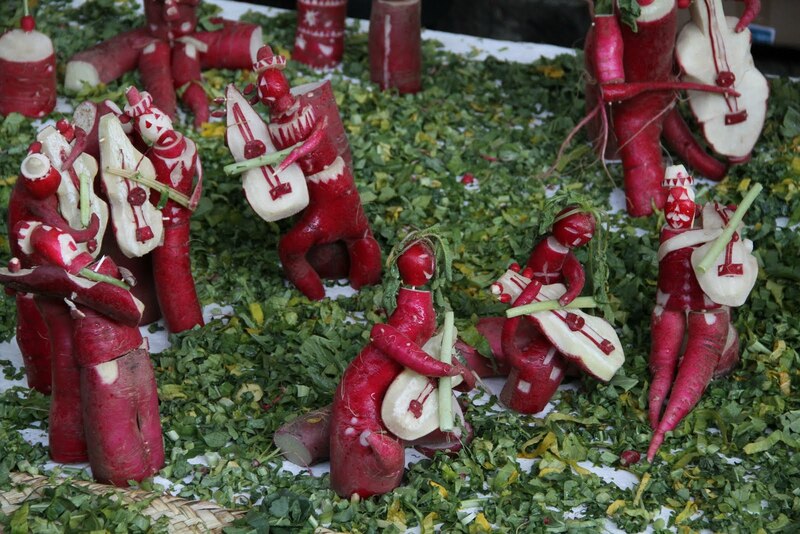 Lasting only a few hours viewers find elaborate radish sculptures , totomoxtle (corn husk figures), and flor inmortal (dried flower) figures representing people, animals and fantasy figures, Nativity scenes, scenes of village life, day of the dead, and even the revolutionary hero Zapata. The Spanish brought radishes to Mexico and the tradition of displaying carved radishes may have originated in the Christmas Vigil market held on the 23rd of December. While the actual origins are lost in legend, in 1897 the mayor formalized the event and it has been held ever since. Today radishes are cultivated especially for the event and can grow to 3 kilos and 50 cm in length. 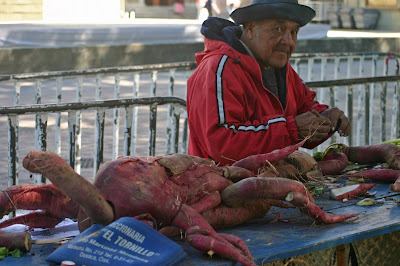 These large radishes naturally achieve contorted shapes to which the carvers add their imagination. Enough background, now logistics, by mid-afternoon the zócalo bustles as contestants set up displays on tables in booths, end-to-end around three sides of the square. There is a viewing platform at the height of the tables about two meters distant. Booths are lit so viewing goes on between late afternoon and (you guessed it) fireworks. It’s hard to imagine anything happening without fireworks. Short of being there, you can view pictures here or at another website planeta which has loads of other information and pictures on Oaxaca.